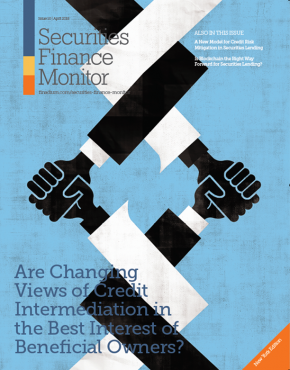 Banks will see their clearing business become bifurcated by tail–risk and credit intermediation, part of which will stay on their balance sheet, alongside a service and infrastructure piece that will be offered by infrastructure providers. The economics of clearing have changed dramatically over the course of the last few years. 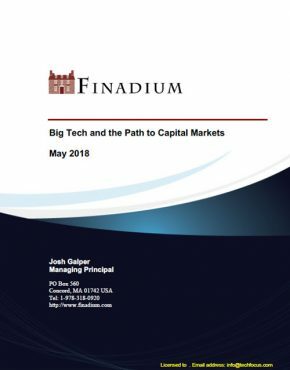 The old business model operated in an environment where liquidity, balance sheet and capital played no or only a minor role; the business model was characterized by economies of scale on the broker dealer level. Large brokers operated global clearing platforms for smaller financial institutions and larger corporations, which would in turn do uncollateralized business with their franchise clients. 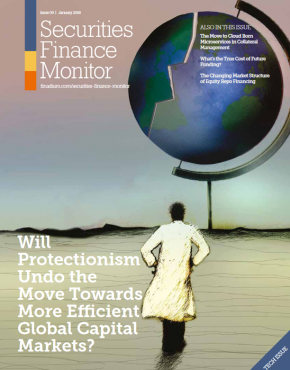 However, in the new world, liquidity, balance sheet and capital have become increasingly limited. Clearing costs are now a function of these scarce resources and consequently, the traditionally scalable and global business proposition has been crushed. The clearing landscape is evolving towards a new paradigm: from a hierarchical network structure towards a more democratic clearing landscape. Smaller, regional and medium sized banks will self-clear, as will parts of the buy side and larger corporates. Also, we will be seeing the establishment of more regional CCPs. This is a substantial change from the historical business model. One-third of the P&L was generated through execution fees on the back of the clearing business. One-third of the P&L resulted from the liquidity / collateral overhang when several clients posted collateral to the broker dealer based on their respective positions (“gross collateralization”), whereas the broker dealer just posted collateral for his aggregated client position with the CCP or exchange (“net collateralization”). 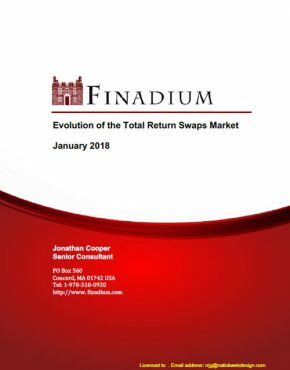 Eventually, one-third of the revenue stream was generated through liquidity term transformation: while the overcollateralization may have had an ultra-short-term legal maturity, e.g. overnight, you could easily argue that the overall volume was stable over time. Consequently, the Treasury department would credit you with a 3-, 6- or 9-month internal ALM credit / Funds transfer price. Where Treasury refused this, clearing desks often had a mandate to re-invest their cash collateral in the money markets, thereby transforming overnight overcollateralization funds into 3-, 6- or 9-month assets on their own. 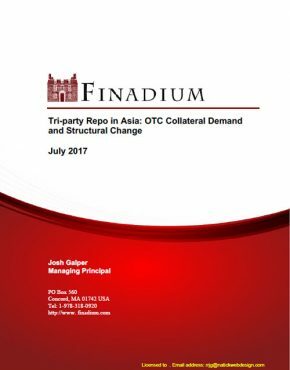 In this traditional setting, counterparty risk was not considered an issue: The broker dealer was indemnified by way of collateral while at the same time considered too big to fail from the perspective of the smaller financial institution using the clearing service. Moreover, counterparties could terminate the relationship by mutual consent, at least in a bilateral trading relationship. A service disruption due to counterparty default or cessation of the service was considered unlikely, but even then, you could easily switch your service provider or derivatives counterparty. There was no such thing as a leverage ratio (in particular in Europe) and / or the cost of balance sheet utilization was negligible. The capital impact was minimal due to overcollateralization, frequent margining and daily pricing. Given these prerequisites, pricing was just a mark-up on per-ticket cost. Given the large infrastructure investments and a more or less fixed cost base needed to set up a clearing business, higher volumes meant lower per ticket costs. The initial investment could lie between US$10 million for a light weight, single product offering to US$150 million for a “follow the sun”, scalable, multi-product solution. Clearing desks massively competed for market share. 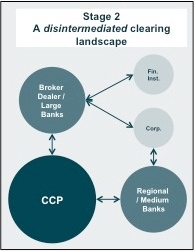 Hierarchical: CCPs connect to few large banks or broker dealers, which would in turn clear business with smaller financial institutions that do their business (unsecured) with their franchise clients on an uncollateralized basis. Monopolized: Few clearing brokers/direct clearing members and few CCPs dominate the market. Global: CCPs, exchanges and clearers established and offered multi-currency, global products for global players. 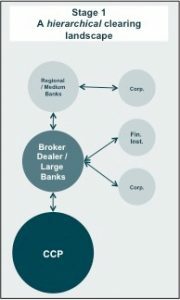 Regional players connect to this global landscape mainly through the global banks and broker dealers. Now, regulation is about to attack these three pillars of the current landscape and will democratize the market, smash monopolies and de-globalize parts of the financial landscape. The traditional model was hierarchical and centralized: Broker dealers and large banks dominate access to CCPs. Smaller clients are intermediated and do business with franchise clients on an unsecured basis. 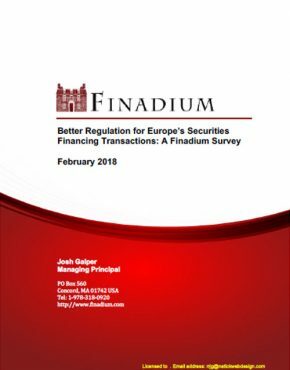 The rationale for making clearing mandatory seems to be straightforward: enforcing transparency, collateralization, standardization and a level playing field for derivatives. But the introduction of mandatory clearing also creates a put risk for the non-clearing member. Take two counterparties agreeing to enter into a 40-year bilateral swap. Both parties engage in a principal relationship between each other. You could stop putting on new business with your trading counterparty and you could also agree to unwind this trade mutually, but you could not just walk away from this relationship. In contrast, when a bank uses a Direct Clearing Member (DCM), the DCM interacts with the Bank only on an agency basis. The DCM is no longer a principal counterparty to the transaction; he is an agent providing a service. What is more, the DCM can terminate this agency service within a relatively short time frame (e.g. 60-day termination period, depending on the documentation) even if the Non-Clearing Member (NCM) has fulfilled 100% of its obligations in a timely manner and is not an imminent default candidate. The DCM can prevent the NCM from adding more trades (even if they are risk reducing) and ask for higher collateralization for the existing portfolio. Even worse: if the NCM does not manage to move / port its portfolio to a different DCM within the 60 days after the agency agreement is terminated, the DCM can declare a default and start a close-out process. Adding insult to injury, a local regulator may subsequently fine the NCM as he does not comply with mandatory clearing requirements any longer. In other words: The DCM can exercise a put option on the NCM at any time and for no specific reason. This is like writing a put option on your own business, where the determination of the exercise price is left to the option buyer. It exposes NCMs to discontinuation risk, giving rise to gap / tail risk (high impact, low frequency), which is pretty difficult – if at all possible – to risk manage. “Porting”, the process of moving the derivatives portfolio to another DCM, may be difficult depending on the overall number of DCMs. During the Eurozone debt crisis some governments found that their collateral became ineligible on global CCP’s. Access by regional banks became restricted and increased the liquidity drain from already heavily constrained regional markets. Regional banks could probably still participate as counterparties, but could not post regional government debt and / or faced escalating collateral and higher margin requirements. Regional retail liquidity before the crisis was used to support global liquidity pools. Banks operated these pools prior to the crisis, moving liquidity around the globe 24/7 as part of a global ALM approach that significantly increased the velocity of liquidity. Regional regulators found that this was impossible to risk manage as globally operating ALM managers were overwhelmed when liquidity became an issue on a global scale. Consequently, regulators are now increasingly trapping regional retail liquidity in their respective local jurisdictions. Within the clearing landscape local regulators want to have “their” markets cleared in “their” CCPs. They want exposures risk managed in alignment with local requirements and regulations. Correspondingly, the number of regional CCPs seems set for an increase: in OTC clearing we had one CCP during 1999 – 2010, rising to around 6 during 2010 – 2014 (two in the US, three in Europe and one in Japan). Now, we see regional CCPs going live in Spain, Hong Kong, Singapore, Australia, Chile and Brazil, among others. As all these regional CCPs have their own regulatory regimes and compliance challenges, this makes global clearing models extremely expensive to operate and to risk control. As such, any bank will ask itself whether it is really necessary to offer these kind of services to its respective franchise. The economics for banks offering global clearing business have deteriorated. Netting benefits have been taken largely away from clearing businesses through increasing account segregation. Also, liquidity with short legal maturities does not improve the liquidity position of banks any longer as ratios like the LCR and NSFR take a strictly legal view with respect to liquidity in- and outflows. Hence, taking in ultra-short term money for a term transformation (as the economic maturity on a portfolio basis could be considered longer than the legal tenor of the underlying transactions) does not work as it used to. Still, the economics from term transformation have been reduced by flat and / or negative interest rates. Hence, two pillars of the former business model – netting benefits and liquidity transformation – have been smashed. 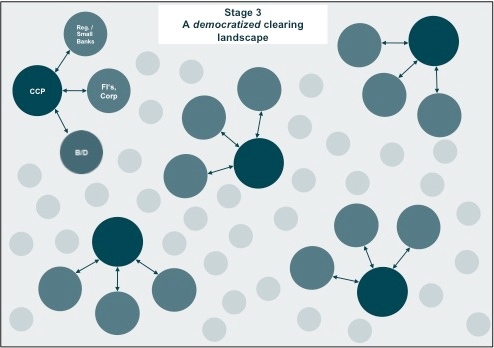 Evaporation of revenues from overcollateralization and liquidity transformation, escalating cost pressures through capital and balance sheet utilization and increasing regional fragmentation of the clearing landscape will lead to less hierarchy and increasing democratization as more and more market participants opt for self-clearing in their respective incumbent markets. An even bigger threat to the economics of clearing for DCMs is represented by explicit balance sheet and capital requirements when doing cleared or OTC derivatives. 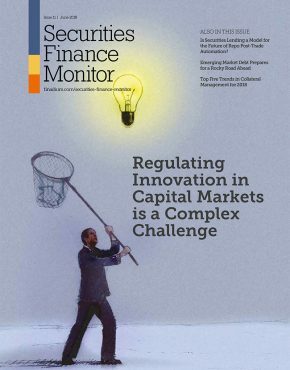 Regulators made balance sheet and capital much scarcer with efforts such as the Leverage Ratio, Capital Buffers, Fundamental Review of the Trading Book, review of risk accounting practices, and many other regulations. Take a DCM operating a client derivatives exposure of around EUR 5 billion. The RWA charge takes orientation from the exposure calculation and hence, RWA would come in at exposure x 8%. To keep calculations simple, let us assume that the DCM operates with capital costs of approx. 10%. The overall cost from these simple numbers would easily add up to EUR 5 billion x 8% x 10% = EUR 40 million (Exposure x RWA x Cost of Capital). The aforementioned investment into infrastructure would come on top of this number. Consequently, banks will only offer client clearing to their top-tier clients and exit other relationships. DCMs will probably retain credit intermediation businesses that justify return on equity but will certainly exit infrastructure and services business that could be offered by non-bank service providers at lower cost. Mandatory clearing represents a put risk for the NCM not considered an issue before. This tail risk can be compared to a put option sold to a DCM, where the DCM can also determine the strike price. If the DCM executes this put option in its own discretion, the NCM has to port its portfolio to another DCM or become self-cleared; quite a challenge in stressed markets and difficult to manage (low frequency / high impact event). This put risk will encourage self-clearing for smaller and medium players currently clearing through a DCM or looking to ensure compliance with mandatory clearing requirements. We will see a regionalization of the clearing landscape with more local CCPs. This will ensure that regional banks connect to regional CCPs directly, as opposed to the current model where regional banks connect to global banks or broker dealers. We will see DCMs exiting their global client clearing businesses for cost reasons, rather than offering traditional risk intermediation products where return on capital can be justified. All of the above will contribute to less hierarchies, and a more regional and diversified clearing landscape. The global houses dominating the market place will be less important. In other words, the end of the hierarchy means a more democratized and more robust market infrastructure. Michael Cyrus is Head of Collateral Trading at Deka Bank. Collateral Trading at Deka Bank encompasses Fixed Income Repo, Securities Lending, Equity Finance, Structured Collateralised Solutions and FX. Prior to this current role, he was head of Short Term Products at Deka. He joined DekaBank from RBS London, where he was global Co-Head of Short Term Markets and Financing responsible for Repo, collateralised Funding, FX and Interest Rate Prime and ETD. 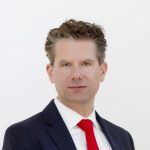 Before RBS, Michael was Head of Credit Financing and Collateral Trading (CFCT) at Dresdner Bank in London focusing on Emerging Market Repo, Equity Finance, Tri-Party Repo and synthetic financing in fixed income and credit markets. He started his career at Dresdner Bank in Frankfurt. Michael has a wealth of experience in the short term money-, repo- and securities lending and financing markets as well as in treasury operations. He holds a degree in economics from the University of Hamburg.